This year is the 20th Anniversary of Flight of the Amazon Queen. I began work on Flight of the Amazon Queen 24 years ago in 1991. It took almost four years to make the game and release it to market in 1995. That journey taught me how to build an adventure game — I coded a game engine, wrote scripts, built editors and designed puzzles. 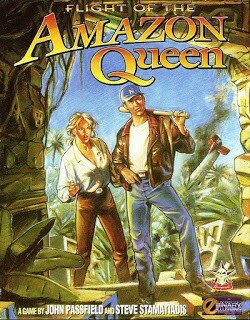 When Amazon Queen finally came out the sense of relief and achievement was tempered with the feeling that I had taken far longer than the folks at LucasFilm to create a graphic adventure. 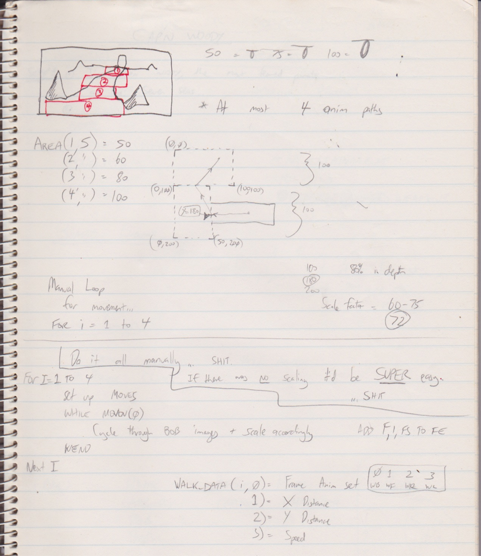 Amazon Queen was made by 3 people with a minuscule budget — myself, Steve Stamatiadis with Tony Ball who ported the game from the Amiga to the PC, translating my AMOS code to C, line by line. Looking back on it all, I think we did okay with what we had. We also had help from some amazing people. The folks at publisher Renegade — Eric Matthews, Tom Watson, Abby Hains, Dan Thompson and our producer Graeme Boxall, believed in us and gave us the chance to show the world what we could do. The game was also enhanced by the amazing music of the late Richard Joseph and the voice direction of Ben Baird — as well as the great cast including Penelope Keith, Enn Reitel, Tom Hill, Debbie Arnold, Lisa Valdez and the late Bill Hootkins and Brad Lavelle. As a kid I was a computer nerd. I had made games when I was in high school during the eighties and managed to sell two of them — a clone of the classic Sega arcade game Pengo that I naively called Chilly Willy, and an original platform shooter inspired by Ghostbusters that I called Halloween Harry. Being an Australian and selling into the local market, fortunes were not made, so I went to university and got a computer science degree. After graduation I started work at a telecommunications company as a programmer and hated it. The work was so mind numbingly boring that it destroyed my love for computers and I sought solace in writing and drawing comics. It was at the local comic shop run by my good friend John Barry that I was introduced to a comic artist who loved computers. Steve Stamatiadis had an Amiga computer and ambitions to make a game. When he learned about the games I had made in high school he suggested we remake Halloween Harry. I had fallen out of love with computers and resisted the idea, but seeing the Amiga rekindled my love. To be brief, I bought an Amiga, we started to make a game, I quit my job and our first company, Interactive Binary Illusions, was born! Halloween Harry, released in 1993. Published as Alien Carnage by Apogee. While we were busy working on Halloween Harry, my friend John Barry introduced me to yet another thing that would have an impact on my life. This time it was a computer game by Ron Gilbert at Lucasfilm Games called The Secret of Monkey Island. 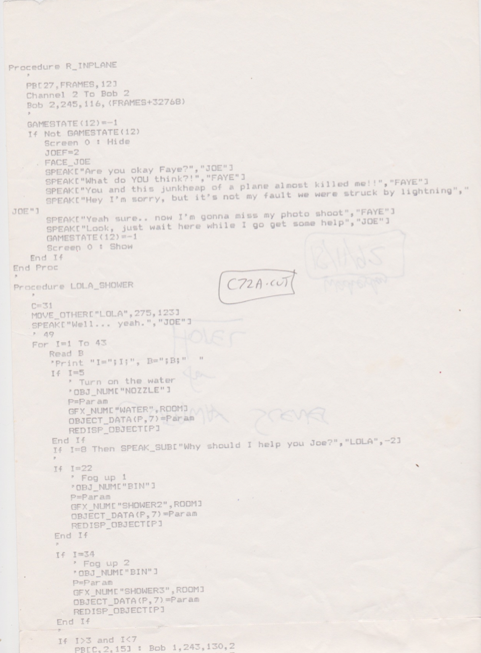 I was a huge fan of text adventures as a kid — in fact an encounter with the original Colossal Cave Adventure had set me on the path of making computer games. Here was Monkey Island, a game that combined my love of adventure with that of storytelling and comic books. I was mesmerized. When Steve and I played the game we knew we had to make one of our own. So, being naive game developers with a game already in production we did what we had to. We decided to make an action platform game AND a point and click graphic adventure at the same time! 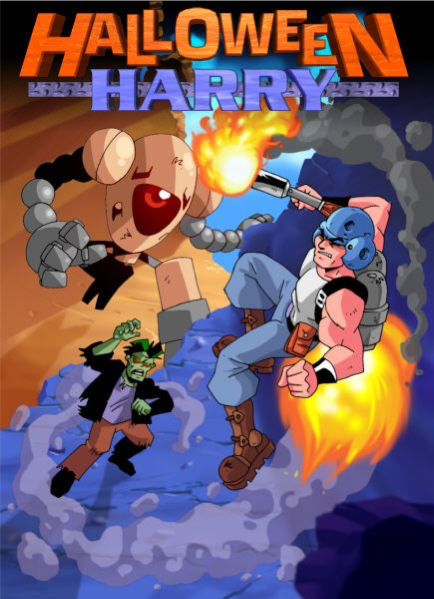 Luckily for Steve and I we met two other local game developers, Robert Crane and Tony Ball, and teamed up with them to take on the programming duties for Halloween Harry. So until 1993 and the release of Halloween Harry, we split our time between the two games. 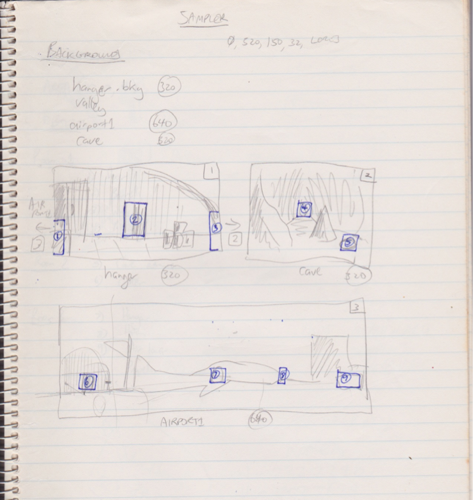 During this time I was keeping a visual diary (which I called a doodle diary) that I drew and wrote in — it was here that I wrote about the beginnings of the game. Steve and I had made our minds up to make our very own graphic adventure, now we had to decide what it would be about. We were both huge fans of Raiders of the Lost Ark and felt that an Indiana Jones inspired game would make the perfect adventure. Ironically, even though The Last Crusade had come out around the same time as Monkey Island, that Indiana Jones adventure game wasn’t really a source of inspiration — instead we drew inspiration from the movies. Although it was a fun game, I think we may have unfairly dismissed The Last Crusade as just a movie-tie-in. So, with a genre agreed upon, we needed characters, story and settings. To differentiate ourselves from Indy, we decided to ground our game in a 1950‘s world inspired by science fiction. Indiana Jones dealt with the occult, so our hero would deal with dinosaurs, robots and aliens. Little did we know that many years later the Indiana Jones movies would enter the same territory with Indiana Jones and the Kingdom of the Crystal Skull. We also wanted to make a funny game so we created our hero, Joe King, a pilot for hire and came up with the most ridiculous plot we could — a mad scientist and his plan to take over the world with an army of dinosaur women using ancient alien technology. As well as Indiana Jones, we took inspiration from many other sources — US and British TV, Monty Python, classic fifties monster movies, Japanese Kaiju films, the Commander Cody serials and The Rocketeer and films like Star Wars, The Seventh Seal, The African Queen and Amazon Women on the Moon. Joe King was on a quest to find one and save the world! The hero of our game is Joe King, a pilot for hire inspired by Jake Cutter from the US TV series Tales of the Gold Monkey. Many UK reviews referred to our hero’s groan-worthy name; Joe King (joking, for those who missed the obvious pun!). Sparky, Joe’s best friend and mechanic was also inspired by Tales of the Gold Monkey. In the TV show Jake’s friend was named Corky. For our game we gave him a comic book fixation (inspired by our own love of comic books) and used this as a way to introduce the Commander Rocket character that played a role in the final puzzle of how to enter the Valley of the Mists. Faye was inspired by Fay Ray and was an amalgam of the stereotypical Hollywood starlet of the day. Although we resorted to the cliche of rescuing the princess (Azura) we wanted to have Faye rescue Joe. Trader Bob was inspired by a mutual friend of ours who ran the local comic book shop. Steve loved manga and anime and there was no way he was going to make a game that didn’t feature some sort of giant robot. So we worked one in to the climax of the game where the Crystal Robot, as the guardian of the Valley of the Mists, grows in size to fight the mutated Dr. Ironstein. Many other characters were inspired by pop culture and real people we knew. The gorilla dressed in a costume that you have to convince doesn’t exist was inspired by a UK Variety Show character called Mr. Blobby. We also threw in some Monty Python and Douglas Adams for good measure. The bellboy at the start of the game was based on an Electronic Arts executive who was incredibly rude to us when we showed him our game. Jimmy and Mary-Lou Cook were inspired by TV evangelist Jim Baker and his wife Tammy. Big Hugh took his name from Hugh Fleming, our friend and comic book artist responsible for the awesome Star Wars Rocks posters and the Dark Horse Star Wars Episode 1 comic covers. Wedgewood the parrot was based on Steve’s own stuffed toy parrot of the same name. 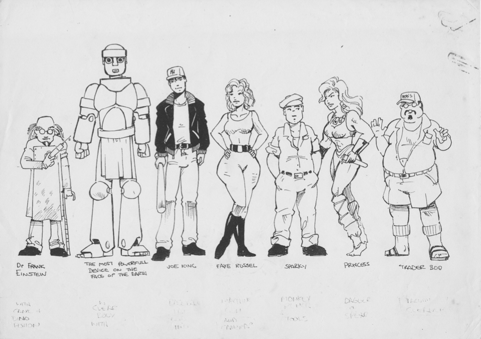 The original cast of characters — from left to right — Dr. Frank Ironstein, The Crystal Robot, Joe King, Faye Russel, Sparky, Princess Azura and Trader Bob. The final cast of characters that made it into the game! Our development tools were fairly simple. I had an Amiga 500 computer and used AMOS, a BASIC like programming language to build the game engine and editors. 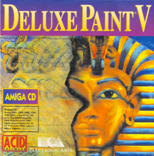 Steve also had an Amiga and used Deluxe Paint to create the art. Like our tools, our game development process was also simple. 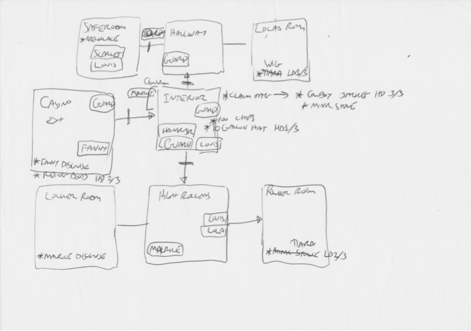 We nutted out the overall plot of the game, listing out locations, puzzles and characters, sketched those on paper then began to implement them into in the editor. One of the first designs for the opening hotel location. Puzzles changed over time. 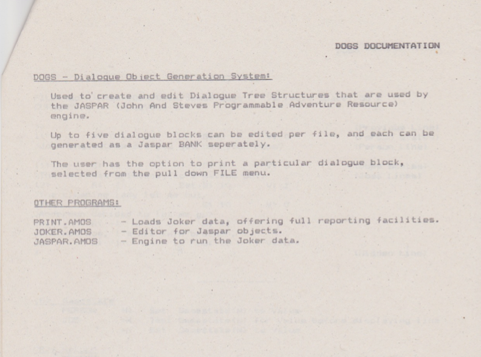 This was the game engine that the player interacted with. In my mind an adventure game is merely a collection of objects that the player could turn on or off, so I designed the engine and editor around this simple idea. 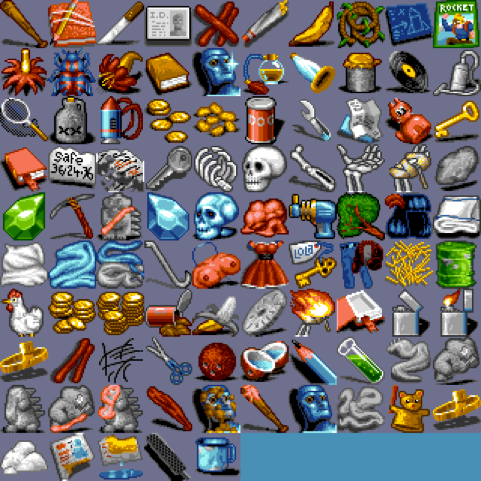 Actors, inventory items and scenery props were all the same — they could either be on screen, or in the player inventory, animating or static. The player could select a verb to use on an object, or use an inventory object on another object — the result of which would trigger a limited set of actions if optional game states were true. These actions were very basic and included playing an animation, hiding or showing an object, triggering a cut scene or dialogue, or changing more game states. With these simple set of options we managed to create an entire graphic adventure. Okay, we were stretching it trying to make this acronym work. Joker was where the real bulk of the game design was done. This was a simple editor that allowed me to create a dialogue tree. Again, this was shamelessly influenced by Lucasfilm. 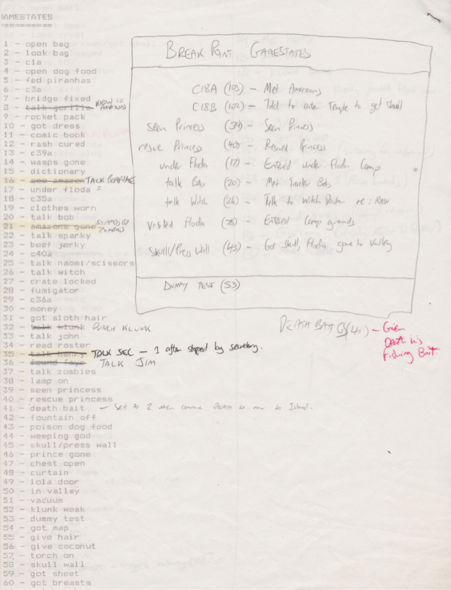 The bulk of the game’s writing was done in this editor. These were SPecial AniMationS that Steve made for actors and props that would play when a puzzle was solved or when a dialogue option was chosen. Joe tying the two sheets together at the start of the game was a SPAM. 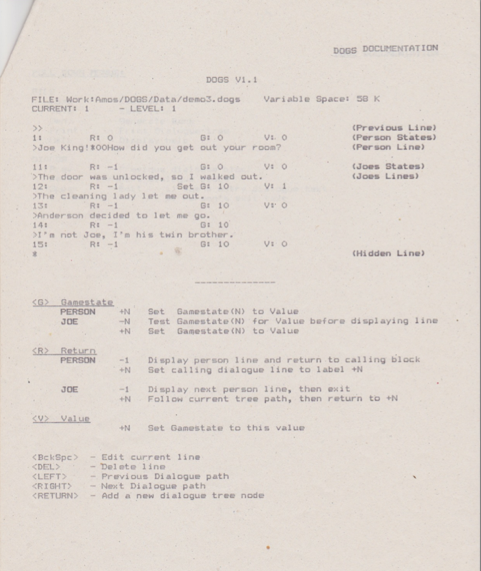 While basic cut scenes were loaded from simple files containing actor movement positions and text to speak, other more complicated scenes were hard coded as functions in the game. It was easier to do this then to extend the editor. Cut scenes could also be trigger from dialogues. This was my non-sophisticated way to keep track of where the player was in the game. It was literally an array called Gamestate that was indexed by each number in this list. If Gamestate(5) was zero then the piranhas hadn’t been feed. When the player used the Beef Jerky on the piranhas then Gamestate(5) was set to 1. 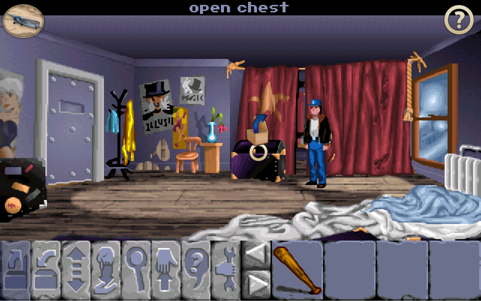 Interactive dialogue trees were a staple of graphic adventures in the nineties, and Ron Gilbert and Tim Schafer were the masters of the form. 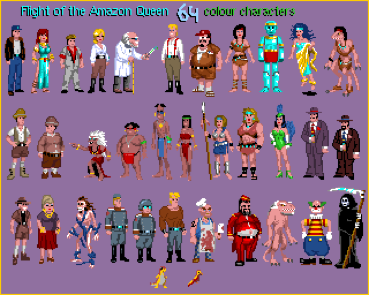 Before making Amazon Queen my writing was limited to the odd story at school and some cartoon strips that I sold to earn money to fund making games. Each character had a number of unique dialogues associated with them. The dialogues were fairly simple branching trees of dialogue player choices and character responses, with options being able to test for gamestates before being shown and to set gamestates if selected. Dialogue choices could be gobbled up if selected, or set to always display. With this simple system surprisingly complex dialogue structures could be created. Again, my design philosophy was to try and adhere to the limitations of the system — the player didn’t miss what they didn’t know couldn’t be done. Even though I was the sole user of the editors I made, I took the time to write user manuals for them. Here are some sample pages for your enjoyment. The top half of this page is a fairly accurate image of what the editor looked like. Each line had a unique ID, usually the line number — which could be drilled down into deeper layers. The G: and V: fields referred to Gamestate and Value and could be tested to show/hide an option or set if an option was selected. Here is an example of the hardcoded cut scene procedures for sequences that were too complicated for the simple CUTS editor to build. The game starts out in Buenos Aires before shifting to the Amazon Jungle in South America. We chose this location as a nod to the movie The Boys from Brazil in which Nazis raised clones of Hitler — as mentioned earlier, the bad guys in Amazon Queen were originally Nazis before we changed them to an international group called Floda. The game was broken down into distinct groups of locations. This was originally made as a demo level and each room ID begins with a “d”. We integrated the demo as the start of the game after Renegade suggested we begin here to introduce the characters and extend the gameplay. 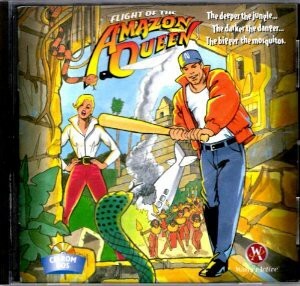 There was where the game originally began after an animated sequence showing Joe’s airplane, the Amazon Queen, crash in the jungle. This location had the first wide screen room in the game. This is where Joe is tasked with rescuing Princess Azura from the clutches of Floda. Joe explores the jungle before finding the secret entrance to the Amazon Fortress. There are still trappings of the original Nazi influence in these locations. Set below a lederhosen factory, the Floda base is modelled in reds and blacks. One of the biggest locations, these rooms and puzzles were fun to design. The final location in the game is only accessible by a jet pack. This is where Joe defeats Frank then escapes with Azura in an airship. I would work with Steve to create some simple mockups of each location, marking out the exits the player could click on to move to the next or previous location. 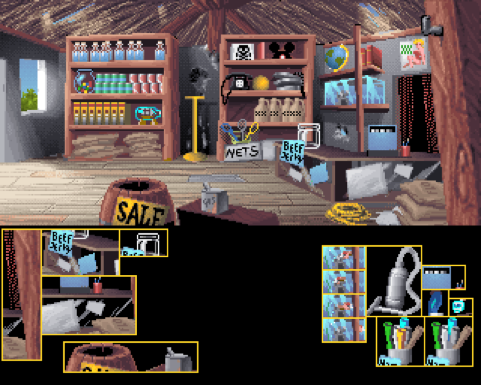 While Steve was busy working on the background, prop and actor art for each location, I would mock up simple Deluxe Paint rooms to block out the locations. These rooms would be simple flat color shapes to show the floor, walls and where doors would be. 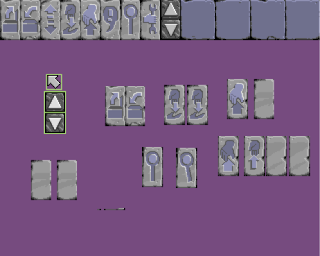 The first step was to link each set of rooms to demonstrate the flow of the game. We called each location a room, regardless of wether it was a room, the back of moving truck, a jungle river or a close up of an important item. 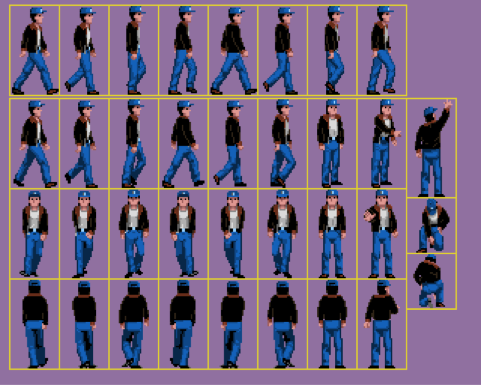 When Steve had built the art for the room, he would provide the background image of the location as well as the individual sprites for foreground objects, puzzle objects and any animating objects that would provide “life” to the location. 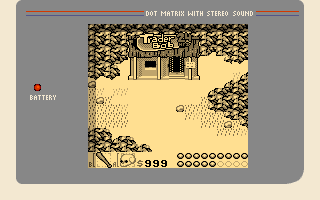 In the Trader Bob location shown here we had the front of the counter as a sprite so the Trader Bob actor could stand behind it. We also had the front of the barrel placed so Joe could walk behind that. Each of these props was sorted on a Y hot spot — so the player could walk in front of behind depending if their foot hot spot was higher or lower than the prop hotspot. After placing each of the props the action fields from the drop down menus would be set. 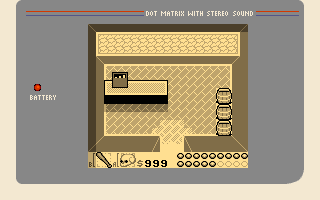 For example the record item could be picked up only if a certain game state was true, then the record prop was hidden and the record item was made visible so it was now in the player’s inventory. To calculate the walk path for Joe I simply placed a number of rectangles on the room screens to match the path ways that Steve had drawn. When the player clicked on the room I would pick the nearest rectangle to the mouse pointer and calculate the shortest path from that rectangle to the one where Joe was standing. 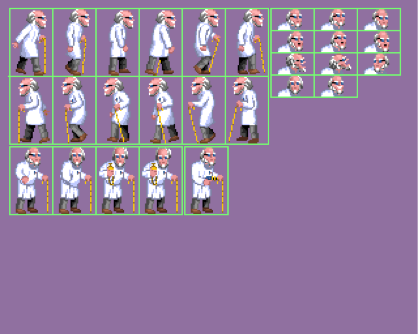 I added a scale factor to each rectangle to shrink Joe based on Y position to simulate him walking off into the distance. 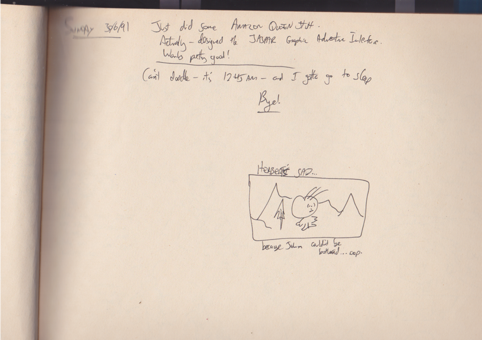 Steve drew and redraw Joe’s animations many times during the project. Joe’s original cap had a New York Yankees logo that had to be removed for copyright reasons (it was distinguishable enough to be an issue!). 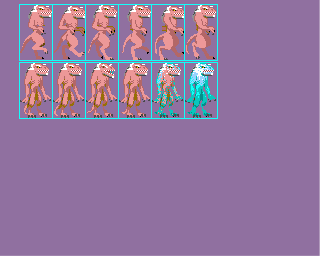 We only animated Joe walking to the right and flipped his animations him when he walked to the left. This was made possible by his symmetrical design. 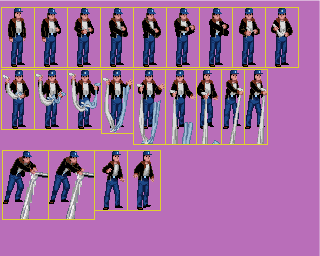 For Frank Ironstein we animated both a left and right walk cycle because he walked with a cane. For the climactic battle against the Crystal Robot we only needed one walk cycle. 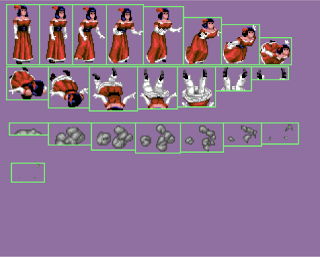 There were over 120 special animation sequences in the game — which we lovingly referred to as SPAMS. Depending on the situation, we would load these up and play them back when they were triggered by a cut scene, dialog or a player action. 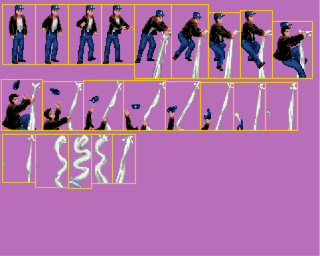 Here are the special animation sprites for Joe tying the two sheets together, and for attaching the sheet rope to the radiator to escape the locked room in the hotel. 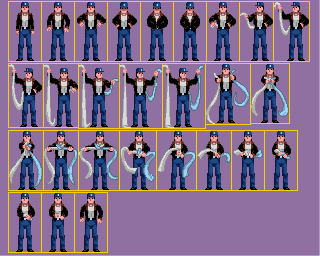 The special animation of Joe using the sheet rope had to be done 3 times. This is because once Joe escapes he can change into Lola’s dress to sneak past the guards, and he can also be wearing his boxer shorts if the guards catch him. 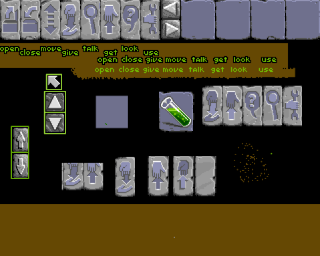 Most early graphic adventures used the VERB interface with a list of selectable words on the bottom of the screen that the player clicked on before clicking on an object on the screen or an inventory item. Standard verbs included open, close, push, pull, give, talk to, pick up, look at, use. For Amazon Queen we settled on open, close, move, give, talk, get, look and use. We combined push and pull into one verb — move. These screens show different variations of button icons used to represent each verb. The final interface layout that we settled on. We created a total of 95 different inventory items, some of which were the same item in different states — such as the baseball bat with gum and the sheets combined to form a sheet rope. As mentioned earlier, Steve redid the graphics for the PC version to give the game a richer color palette. Here is an example of the differences. Don’t ask me why there is a clown in the lineup. Steve sometimes had the habit of creating new characters on the fly and this guy didn’t make the cut. The publisher had a sales office on the Gold Coast in Australia, and when we first began making Amazon Queen we began to look for someone who would be able to publish it. We arranged to visit Electronic Arts to see if they would be interested. They showed interest in the game, and were kind enough to lend us a PC so we could begin converting the game from the Amiga to DOS. Being young and naive we didn’t ask for an agreement, and spent the next few months making the game and reporting back to them on the progress thinking they’d publish it when it was finished. One day they informed us that their US boss, a senior vice president of Electronic Arts, would be visiting and that we should come down and show him our game. We had playable builds for both Amazon Queen and Halloween Harry (our platform game that would be published by Apogee) so we set up an Amiga and PC in the EA offices ready to show the exec. We were proud of the progress we had made and excited to show him each game. We were even hoping that we would leave with a publishing contract. The VP burst into the room and I offered to shake his hand as I introduced myself. “Don’t bother telling me your names as I won’t remember them!” he snorted. He walked over to Halloween Harry that was running on a PC. “This is the wrong game for the PC, arcade games don’t sell.” he informed me. 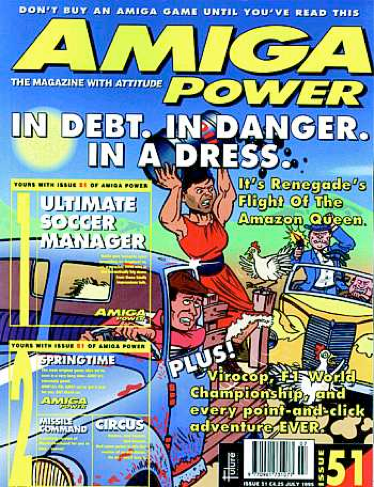 Then he moved to the Amiga where Amazon Queen was running. Then he began a tirade about how terrible each of our games were, how an adventure game from anybody but Lucasfilm would have to be 100 times better than theirs to even stand a chance of success. He spent over 10 minutes being the most arrogant and rude person he could. Then he left. When I got home to Brisbane I was so mad and so determined to prove the exec wrong that I rifled through every PC and Amiga games magazine I had and compiled a list of every publisher I could find. Then over the next week I duplicated multiple floppy disks of the Amazon Queen, printed up covering letters and posted them off overseas. Over the next few weeks I waited by the fax machine for possible replies from publishers and to my relief I began to get replies by mail and fax. A number of publishers had received the floppy disks, played the game and liked it! Things began to progress rather quickly as these new publishers began to talk about contracts and publishing terms. I was so happy — our game was going to be published! Then, an amazing thing happened. I received a phone call from the UK. “This is Eric Matthews from the Bitmap Brothers,” said the voice on the other end. I was in awe. The Bitmap Brothers were the coolest game developers around — responsible for Xenon, Speedball, Magic Pockets, Gods and The Chaos Engine. They were video game rock stars. And they liked our game. The Bitmap Brothers had created a new games publisher called Renegade Software with music label Rhythm King. This new publisher offered creative control, amazing royalties and best of all, the opportunity to work with amazingly talented people. Steve and I signed with them immediately then flew over to Chicago for the Summer CES of 1993 to meet with Eric and his team. After that we arranged to spend 4 months in the UK to finish the game and record the voices. Tony Ball had joined our team full time to help finish the PC version and he joined Steve and I in the UK. The feedback from Eric and our producer Graeme Boxall was great, and the entire Renegade team including general manager Dan Thompson, marketing director Tom Watson and office manager Abby Hains did all they could to support the game. One of their suggestions was to add a new sequence to the beginning of the game to introduce the characters, set up the story and extend the play time. We figured a prelude similar to the Indiana Jones movies would make perfect sense so we started at the end of a previous adventure. This gave us an opportunity to incorporate a new character into the game — a snivelling bellboy inspired by the obnoxious EA executive who was incredibly rude to us. The hotel bellboy’s dialogue revolves around his Uncle EA. 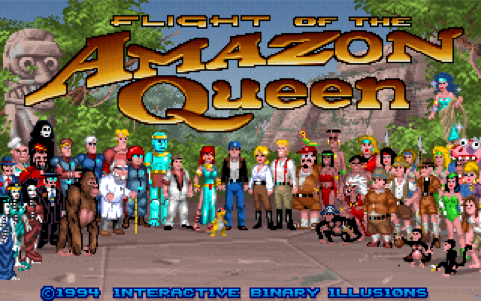 After a lot of hard work we finally completed Flight of the Amazon Queen it came out in 1995. Initially the sales weren’t too good and I was convinced that it was a flop. Steve and I couldn’t believe it. After all of our hard work they quietly shipped the game out to the US market with a cover featuring pygmies (not in our game! ), a cobra (not found in South America!) and Joe King drawn from what looks like a stock baseball pose. It was embarrassing. And more did come. It kept us in business until 1999 when we became Krome Studios and began a massive growth spurt. 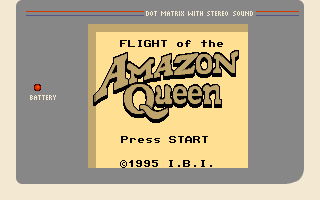 We explored the ideas of adapting Amazon Queen to the Game Boy. I am a huge Nintendo fan and the challenge of recreating the game on a handheld was exciting. Steve mocked up these images to show how we could have adapted the core game play and story to the original Game Boy system. 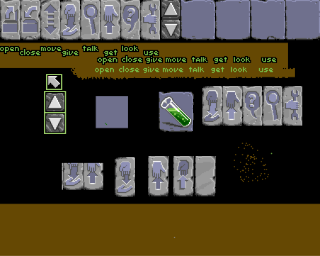 Players moved Joe with the D-Pad and used SELECT to open the inventory screen to could equip items to the A or B buttons to use in game. Press A to talk to a character with an option to give them an inventory item. Sadly the project didn’t get any traction. Flight of the Amazon Queen got great coverage in the UK thanks to Renegade’s awesome marketing department. We even managed to get on the cover of a few magazines! That was the nature of games back then, technology moved so fast that games became outdated and abandoned. But one thing I didn’t count on was the amazing power of the internet and the incredible reach of mobile devices! 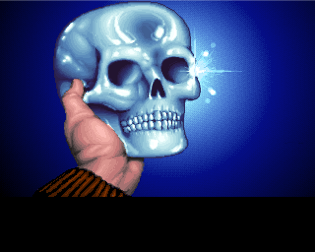 The team at ScummVM did a great job making the game work again on PC and for the first time on the Mac. Then GOG.com got in touch and asked if they could feature it on their site. “Of course!” was my reply. The idea of hundreds of thousands of new fans playing the game was exciting. Then MojoTouch reached out to me about bringing Amazon Queen to the iPhone, iPad and iPod Touch. 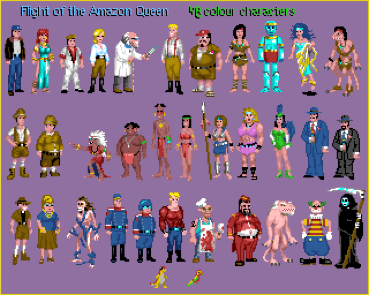 Thanks to ScummVM, GOG.com, MojoTouch and fans from around the world, Flight of the Amazon Queen has lived on on brand new platforms for new (and old) fans to enjoy. So, what does the future hold for the Amazon Queen? Well, given that it is the 20th Anniversary I’ve started work on a sequel. I’ve thought long and hard over the years about how an adventure game could be built that feels fresh but still captures the essence of the old point and click games. Ron Gilbert and Gary Winnick are doing an awesome job with Thimbleweed Park by recreating the look and feel of Maniac Mansion but with modern design principles. Those guys have that approach covered. For me, I’ve been inspired by the Apple Watch and have begun to build the sequel with that device in mind. I had actually built a prototype for a “point and click text adventure” years ago. While fun to play, I didn’t think there could possibly be an audience for such a game. But the warm reception for games like A Dark Room and Lifeline on mobile has given me hope that this format could work. 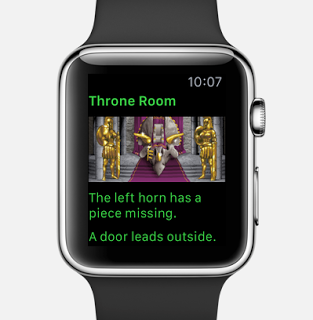 And of course the Apple Watch is such a cool gadget that who wouldn’t want to have an adventure on their wrist? It’s still early days, but please stay tuned to find out more! Helped my kids make Beetastic. Made Halloween Harry, Amazon Queen, TY the Tasmanian Tiger, Save Our Village and some  Watch. Making Unity games.